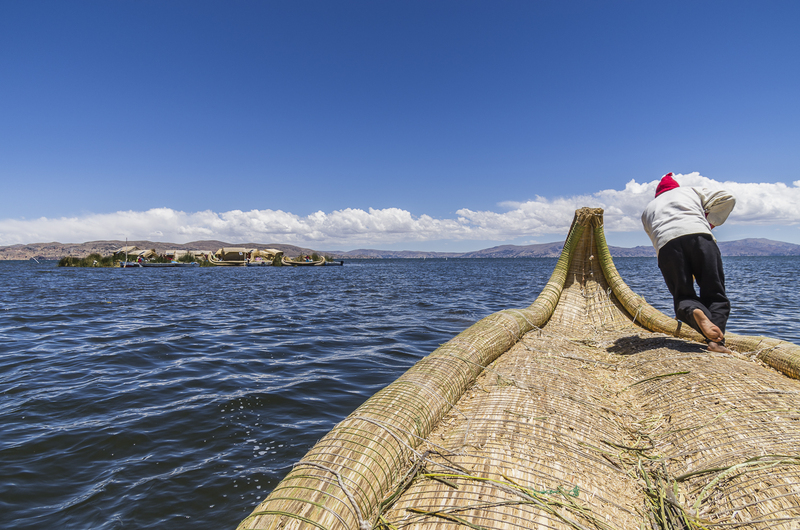 Lake Titicaca is the highest navigable lake in the world, sitting at an altitude of 3,812 m (12,507 ft). Its ownership is shared by both Bolivia, which has the eastern part of the lake, and Peru to the west. 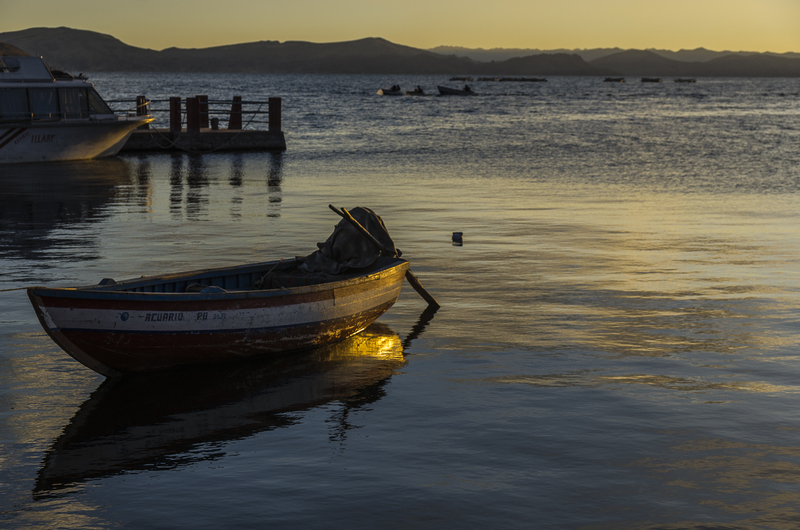 For land-locked Bolivia, this is the next best thing to being near the ocean and like many places in Bolivia, it is steeped in rich history and legend. 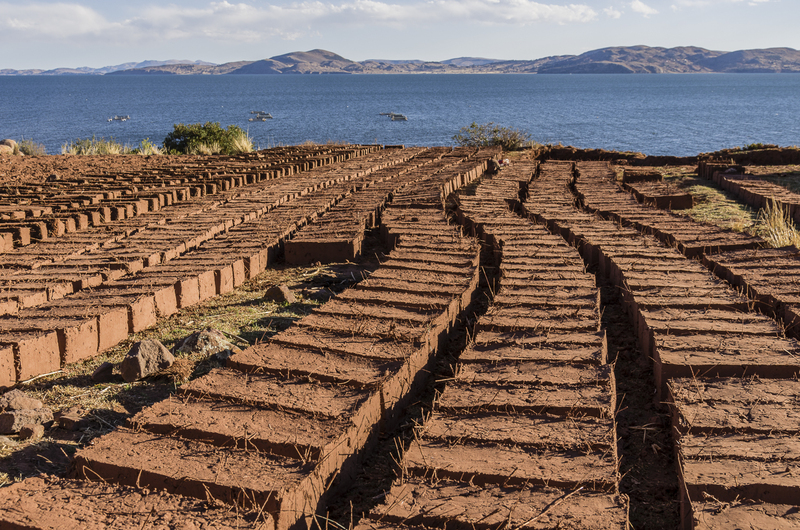 According to Inca legend, the god Viracocha arose from Lake Titicaca to create the world. He commanded the sun god, Inti and the moon god, Mama Kilya and the stars to rise. The first people were created from stone and brought to life by Viracocha, who told them to go out and populate the earth. 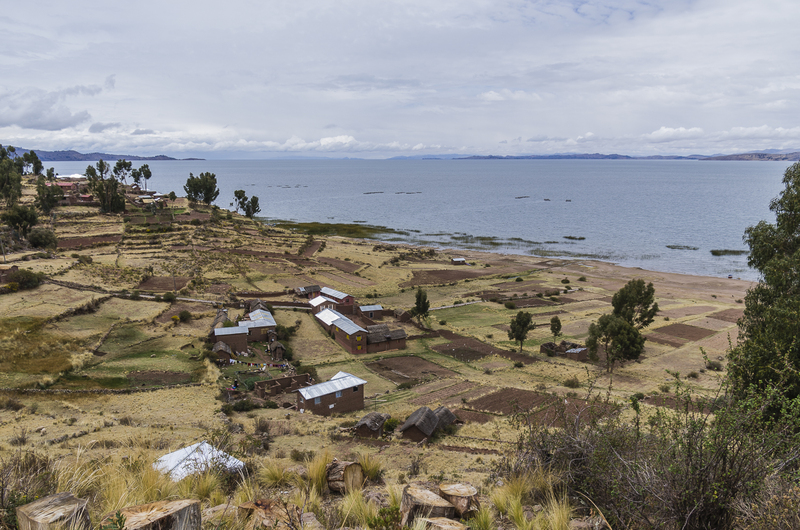 This makes Lake Titicaca the birthplace of the Incas, whose spirits are said to return here upon death. We started our visit with a bus ride from Arequipa to Puno. Puno is a tourist-ready city and is best to be avoided. 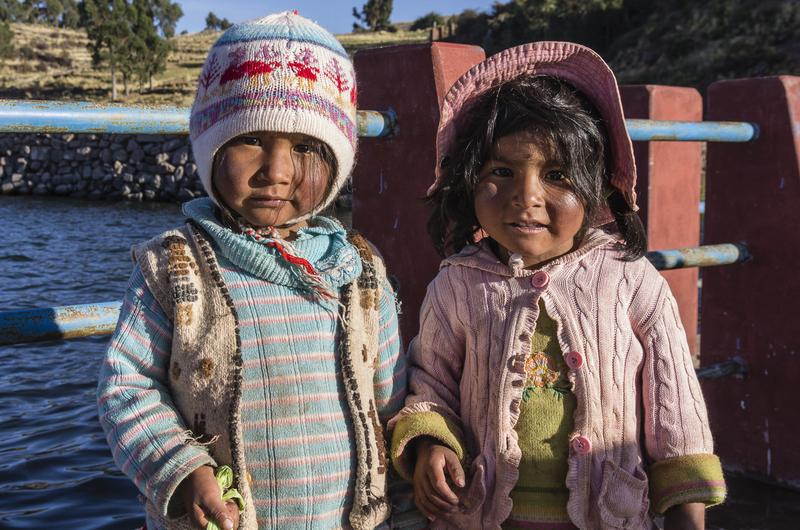 While many visitors head straight for the popular islands of Amantani, Taquile or worse, the floating island of Uros, we were keen to explore the less-visited and equally beautiful Capachica peninsula. The main village on this small peninsula is Llachon. It’s easy to get here. You simply ask some local people in Puno where to catch the minivan that goes to Capachica. It’s about a 10 minute walk from the main square and costs about US $3. The vans leave when they are full. It is helpful to speak at least basic Spanish because no one speaks English or other languages on the peninsula. Also, be sure to bring all the cash you will need because there are no banks/ATM’s. If you are planning a homestay, some little trinkets or small toys for the children or some groceries are often greatly appreciated by the families. We planned to spend two nights in Llachon. We had nothing arranged in advance and were pretty clueless about where we were going to stay. I had read that you could stay with families on the peninsula and we just planned on asking around once we arrived. Fortunately for us, a man named Miarardo was a passenger on our mini bus. Since we were the only gringos with big backpacks on board (we stuck out just a bit), he approached us when we arrived to Llachon. 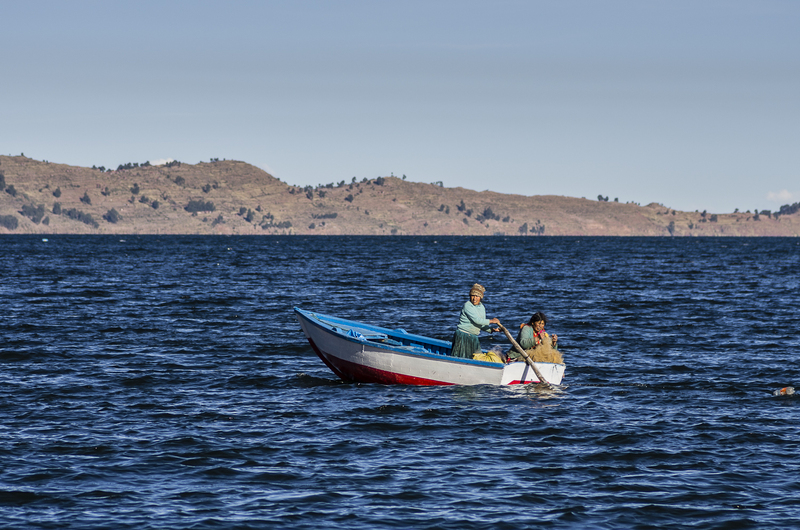 He told us his family was one of several that hosted foreigners for a homestay, so we followed him about 15 minutes away from the main plaza to his simple home with scenic views of Lake Titicaca. We agreed on a price for full board (breakfast, lunch and dinner) as well as accommodation for 80 Soles (US $28). The room was basic but comfortable. He had even created a solar shower for guests which, to our huge surprise, actually had piping hot water! We were happy that the money would go directly to him and his family. There are many families living on the peninsula that will host you. Here is a map to help you find willing families. Or you can just show up like we did. Life on the peninsula is difficult. The people farm and fish to get by. They depend on the lake for survival. Bartering fish for potatoes is commonplace and the little bit of extra money they can earn from tourists really helps them out. It was important for us to arrange our trip here independently so that we knew exactly where the money went. 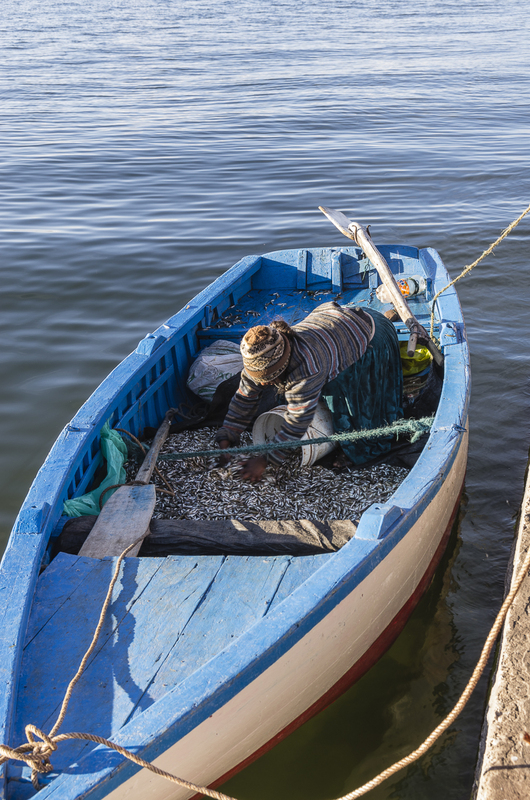 If you really want to understand the culture of the people living around the lake, staying on the Capachica peninsula is a unique way to get a small glimpse into their lives. 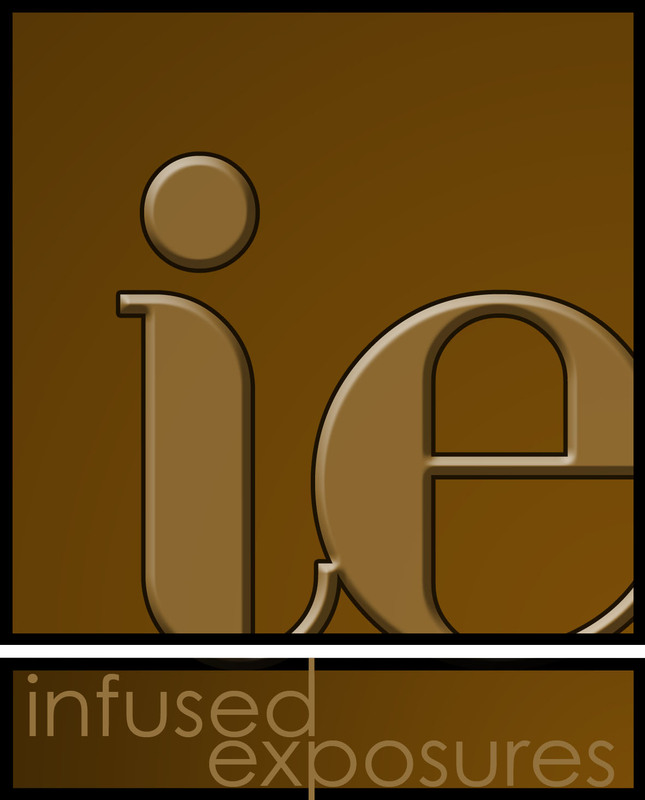 If you don’t like arranging things independently, we heard this company is reputable and will make the arrangements for you. Llachon is a tiny town, more like a village. The total population is well under 500. 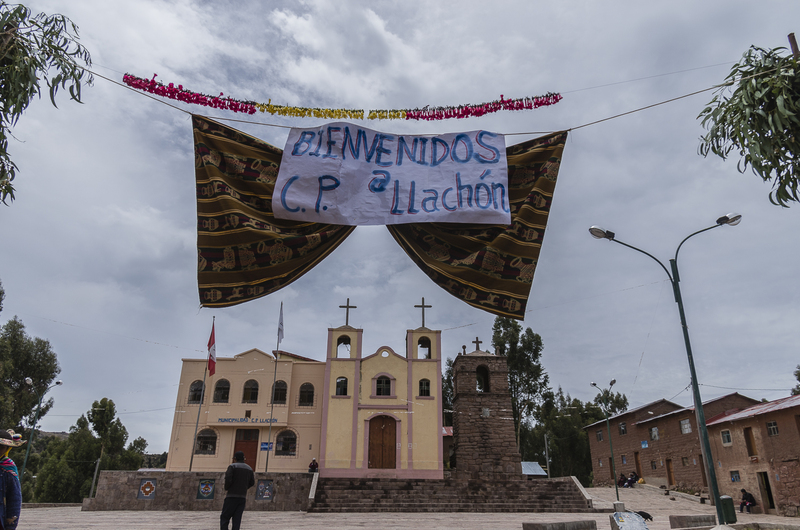 If you come from Puno, the minivan will stop first in Capachica (the first town on the peninsula) and then you can get into another van that’s headed to Llachon (just ask the driver first to be sure). We arrived in the main square, the cathedral facing us. 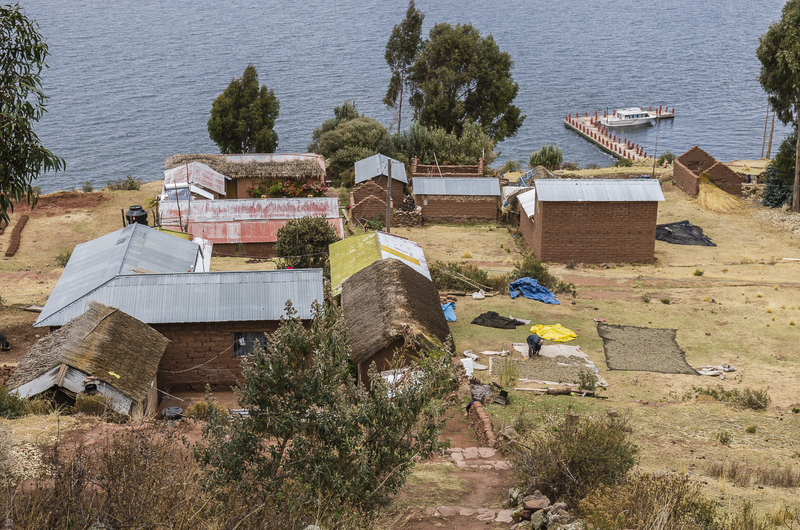 The village charmed us immediately with its commanding views of Lake Titicaca from every way you looked. We were lucky to have such a kind, welcoming man riding with us. Mirardo and his extended family (including his father, mother, wife, 3 sons and sister’s family) live here in this group of houses made from hand out of adobe bricks. The family receives about 15 groups of people (sometimes couples like us or other times small groups of friends) for the entire year. For whatever reason, tourism is not popular here. The tourists flock to the other islands on the lake but the peninsula often gets overlooked. For us, this resulted in a more intimate experience with the family. The fact that the house overlooked the lake magnificently didn’t hurt either. Sunrise to the left, sunset to the right. Beauty all around. On our first morning we woke up early to help Mirardo and his family with the daily fish. The alarm beeped loudly at 5 am but as we walked bleary eyed down to the dock we were rewarded with this incredible sunrise over the lake. Witnessing such beauty, I could easily imagine how the ancient Inca’s were spiritually drawn to this lake. 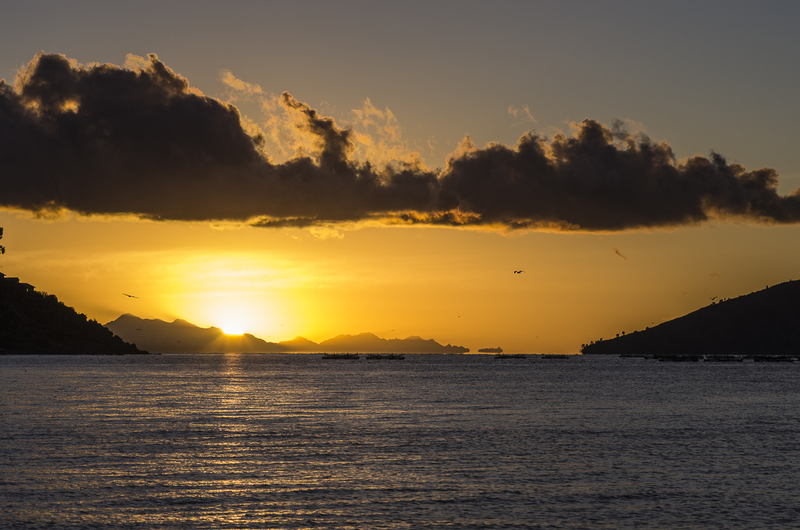 Life revolves around the lake for the people of the Capachica peninsula. Their entire lives depend on it for eating and trading freshly caught trout or a small fish known as ispi. Mirardo explained the process to us. Every day nets are placed in the water. Later, in the night, he goes out in the dark, inky waters to pull up the nets. The fishing boat gets filled to the brim with the tiny ispi fish. In the morning, his sister goes out to bring the boatloads of fish in. Now the laborious work begins. 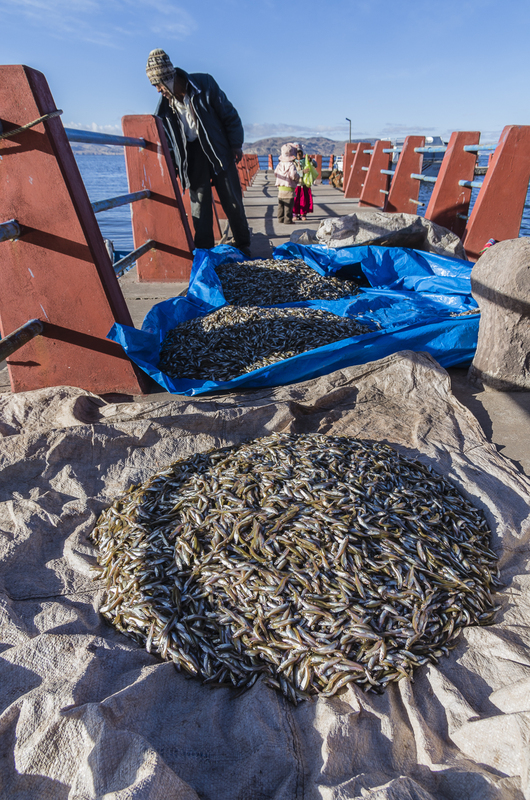 Buckets are used to bring the fish out onto the dock. They are placed on large tarps which get folded up and each member of the family takes turns carrying them on their backs, uphill, so that they can dry in the sun. Everyone takes their turn, from the youngest child to the grandparents. It takes hours to finish carrying the fish up and they must work quickly to take advantage of the day’s light. The fish are brought here, to the highest plateau where the houses are located. They are placed either directly on the ground or on tarps. The nets are hung up too and everything is dried in the sun. The whole process gets repeated every day. The ipsi are eaten whole-the bones are just soft cartilage. A common preparation is to mash potatoes with the ipsi and oca (a root vegetable similar to a carrot). Most of the ipsi is traded with neighbors for other goods such as potatoes. The taste was of nice, fresh fish. Fishing isn’t the only daily work that is needed to be done. Every day, the family all takes turns making these adobe bricks. They are made from the clay in the soil and pieces of straw are incorporated inside. This helps to keep the bricks strong. They are shaped and left to dry in the sun. We visited in the dry season but one day the clouds rolled in and it began to heavily pour. Mirardo and his family rushed about to try to cover all the precious bricks but they didn’t have enough material to cover them all up. It was devastating for us to watch. All their hard work was being melted away by the rain. I felt horrible for them. Grandma and grandpa and all the children were outside with no proper rain clothes, sandals on their feet all making a futile effort. You would think this hardship would have left them all depressed. It was quite the opposite. Instead, they were outside laughing. They were all together, dripping wet, their work was ruined and it didn’t matter. The hard working and happy spirit radiated from within each of them. One of our favorite parts of staying with this family was interacting with all the members. Grandpa was always willing to stop work for a moment to have a chat with us. 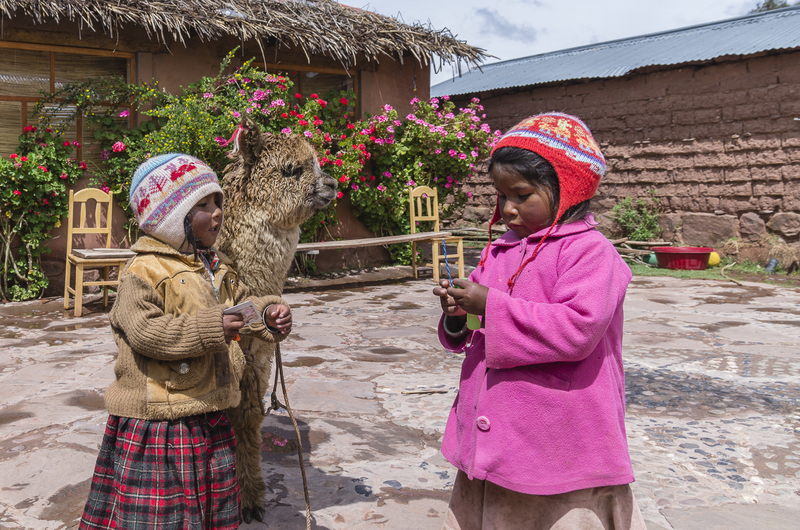 And these two little girls were so adorable with their pet alpaca. They had no toys to speak of, were wearing tattered clothing but remained happy and playful like any other children. No ipads or video games needed. Just lots of sunshine and already learning how to work. The Uros island that is plastered all over the brochures in Puno is somewhat of a scam. 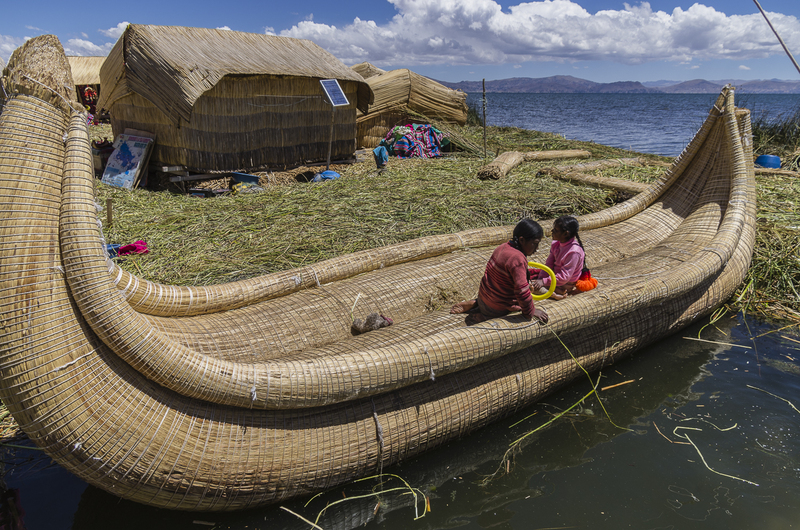 Tourists visit the island in droves to see the ‘local people of the floating island of Uros’. It turns out that these people don’t even live there! They live in Puno and everyday they dress up in traditional dress and go over to Uros and sing row, row, row your boat for the visitors. Not very authentic. The island itself is unique and it does actually float on the water. It’s made from the reeds that grow everywhere around the lake. The reeds are used for everything, to make the island, the houses and boats. You can even eat the reeds! 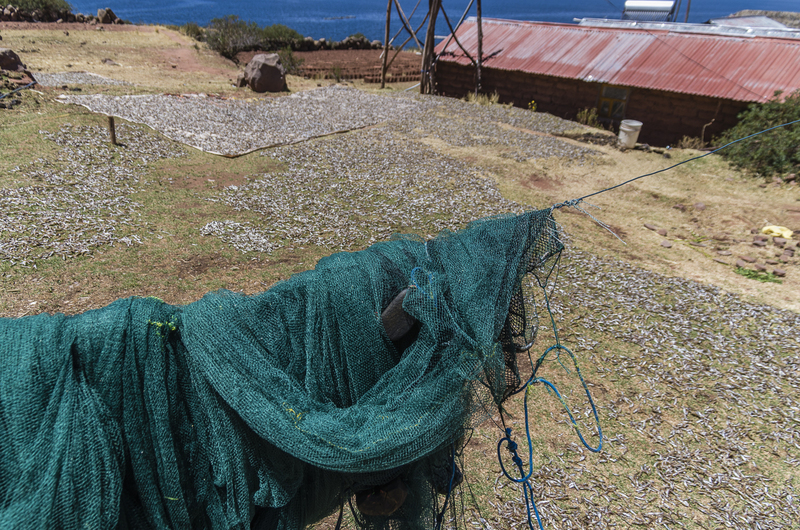 Just off the peninsula’s coast, lies the tiny Uros titino village. This is a real village, not one just set up for tourists. They do allow visitors and sell various handicrafts to help them earn some money. It’s a bit more of an authentic way to discover these fascinating floating islands. Mirardo will take you over in his fishing boat for a small fee (remember to bring extra cash with you). Our experience staying with this family was one of the most unique we’ve had in all of our travels. We got to experience a different way of life for a few days. We ate fresh fish every day (including the best trout of my life) and were surrounded by an area of impressive, scenic beauty. We witnessed people who have both nothing and yet everything. The hardships they face, directly against nature, harken back to earlier, more simple, times. In our modern society, filled to the brim with gadgets and unnecessary stuff, it’s refreshing to imagine what life was like years ago before we started ‘needing’ so much. I will never forget this family and am so grateful to have been part of their daily life for the briefest moment. thanks for reading! I loved remembering it all. That family will stay with me for life. You had to see them all laughing in the rain! It was something else! I remember getting upset when I was typing a word document and lost the whole thing right before I was getting ready to publish it-I was so upset! I cursed and was in a bad mood as I redid it. I am sure this family was out the next weeks just simply rebuilding the bricks like nothing. No curses, only smiles. I could learn a lot from them! Fascinating to see the whole ispey fishing process. It sounds like a wondeful place from where to experience Titicaca.